As a business grows, the laws and regulations it must adhere to become increasingly complex. Ensure that your business is legally compliant today, tomorrow and in the future with a compliance check from Scott Human Resources. Legal compliance is the core of a business prepared to grow. How do you keep up with legal changes that affect your employees and your business? Scott Human Resources is your partner in ensuring your business is legally compliant with recent state and federal laws. Federal and state laws change rapidly; ensure compliance with FLSA, FMLA, COBRA, I9s, harassment and more. It’s our priority to stay abreast of the ever-changing legal climate and to quickly communicate those changes to our clients. Clearly communicate expectations to employees and ensure legal compliance in your employee handbooks. We can review and create handbooks that are current with workplace trends, introduce policies, and alleviate confusion. Can you correctly answer these questions? 1. The form I-9 is required by the I.R.S. for every employee hired to verify identity and eligibility to work in the U.S. Which of the following statement regarding the I-9 is true? A. The I-9 can only be completed on paper and mailed/faxed. B. The I-9 has a filing fee of $5 per form. C. The I-9 form has remained the same since 2011. D. The I-9 form was last updated in 2017 and new hires must use the current form. 2. Which of the following statements have been ruled as overly broad and illegal to be included in your Employee Handbook? How did you do? Do you know what your company’s biggest liability is? The answers are: 1) D; 2) D; 3) D; 4) E.
Get an expert opinion. 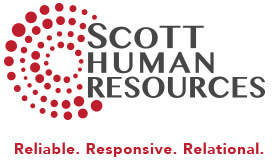 Rest assured that your business and materials are legally compliant with a compliance check from Scott Human Resources. Sexual harassment news has swept across the country and raised awareness in our workplaces, so it’s a good time to look at your anti-harassment policies and procedures to make sure they’re up to par. As an employer, your obligation to provide leave could go beyond the 12 weeks afforded under the FMLA. For example, a request for intermittent leave to treat a medical condition may be a reasonable accommodation under the Americans with Disabilities Act (ADA).